On the 5th of December 2018 new research was published by palaeontologists in the Journal of Nature about the analysis of blubber tissue in a preserved specimen of the Early Jurassic ichthyosaur Stenopterygius. This article will examine this fossil discovery and why it is important evidence for warm bloodedness in ichthyosaurs. So here it is! This will be my final fossil discovery focused article of 2018, which has been an incredible year for palaeontological discoveries. My past articles have covered a range of Mesozoic fossil discoveries, from the discovery of the sauropodomorph Macrocollum itaquii in Brazil, the discovery of diplodocid Andrew in Montana, the pterosaur discovery of Caelestiventus in Utah and many more. I didn’t expect this year to bring so many amazing, paleontologically changing fossil discoveries and we are not done yet! Most recently on the 5th of December new exciting research was published in the Journal of Nature about Stenopterygius, an Early Jurassic ichthyosaur (a marine reptile) confirming that these creatures were warm-blooded. Many News and Science websites quickly picked up the story about this incredible fossil research and these included: BBC NEWS, The National Geographic, Discover Magazine, Smithsonian, Yahoo News, Science News and many more. The research by palaeontologists was the examination of the fossilized skin, cells and traces of blubber found on the fossilized ichthyosaur specimen which was found in the Holzmaden quarry in Germany. Stenopterygius could grow up to 13 feet in length and lived in what is today southern Germany around 180 million years ago, during this time parts of Europe were covered in a vast ocean (Science News. 2018). Ichthyosaurs first appeared some 250 million years ago and thrived for most of the Mesozoic era, they were abundant in the Later Triassic and Early Jurassic but decreased in diversity through the Middle Jurassic into the Cretaceous. In the research on Stenopterygius palaeontologists used a variety of techniques to analyse the fossil, these included using ultraviolet light and x-ray imaging technologies to identify and examine the fossilized skin remnants, along with additional molecular analysis of the fossilized blubber. Blubber (energy which is stored as fat) is found today in “warm blooded amniotes (mammals, reptiles and birds) that spend all or much of their lives in cold water (such as whales, seals, polar bears, leatherback sea turtles and penguins)” (Tarlach G. 2018). Fossil remains of Stenopterygius. a, b, Photographic (a) and diagrammatic (b) representation of the fossil in oblique ventral view. Image credit: Lindgren et al, 2018. The discovery of blubber on an ichthyosaur is an example of convergent evolution. Convergent evolution is where unrelated animals develop evolutionary traits due to the ecological areas/niches that they inhabit. The skin pigmentation also found on the fossil suggests that the animal would also have had a camouflage like pattern. Stenopterygius would have had a really dark upper skin and a lighter under skin enabling the ichthyosaur protection from aerial predators such as pterosaurs and pliosaurs which would have attacked from below (Rincon. 2018). The discovery of blubber on Stenopterygius confirms that these marine reptiles were active, that they had to maintain high body temperatures to retain body heat. Stenopterygius blubber confirms that this ichthyosaur was an endotherm (relying on internal bodily functions to generate heat) which is unlike ectotherms (which rely on an external/environmental heat sources such as sunlight). This discovery is important because for a long time marine reptiles like ichthyosaurs were thought to most likely be warm-blooded, this research goes a long way to proving this long held theory. New palaeontological discoveries are happening all the time, many fossil finds like Stenopterygius are confirming long held theories about what we thought we knew as well as opening up the opportunity to explore more of the story of life during the Mesozoic. These opportunities to explore more are incredibly exciting and I cannot wait to see what information and research comes about as a result of further scientific analysis. 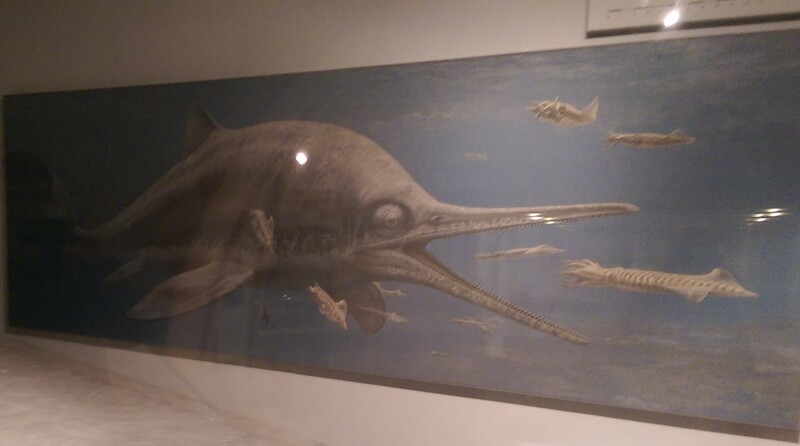 Artist impression of an Ichthyosaur at Bristol Museum & Art Gallery. Image credit: James Ronan, 2018. I hope you have all enjoyed this article! I have really enjoyed reading all the details about this research, it’s a fantastic fossil discovery to close this year out with. I just wanted to say a big ‘Thank You’ to everyone who has read my palaeontology articles this past year, it has been an incredible year of palaeontological wonder and discovery. I hope everyone has a happy, blessed and peaceful Christmas and a fantastic New Year! 2019 should hopefully offer more ground-breaking fossil discovery’s, changing everything of what we thought we knew of the world of dinosaurs and palaeontology. You can keep up to date with all my blog posts here and you can follow the blog on the main page by signing up your email to receive my latest posts. I look forward to sharing more with you all in 2019! Previous Some Exciting Jurassic News! Next Jurassic Finds sees over 4,000 readers in a year! Thank you everyone!